This is quite a silly name for such a serious goody! 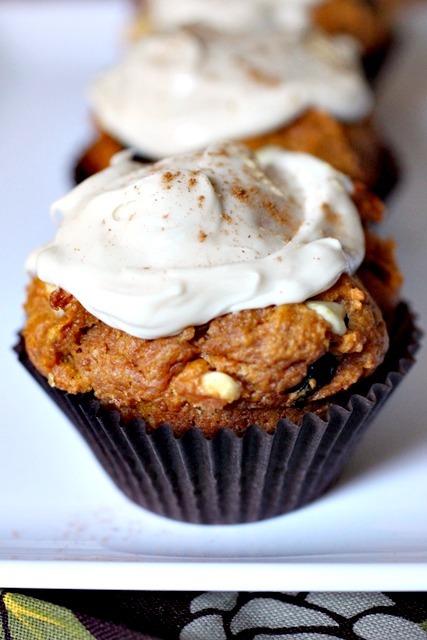 These Pumpkin Yumkins are a cross between a pumpkin cupcake and a pumpkin muffin so rather than calling them one or the other, isn’t it so much easier to call them a Yumkin? They are dense, filling, and oh so delicious…and it took every ounce of my energy not to have a second one this morning for breakfast! I made a few changes to the recipe, which you’ll see below. The original recipe calls for pecans and dates but I swapped in white chocolate chips and raisins, two of my favorite mix-ins and substitutes in recipes that call for nuts. I also used vanilla extract and maple flavoring in place of the orange because I’m infamous for not reading all of my planned recipes before going to the grocery store. It’s all good though since vanilla and maple are the perfect compliments to pumpkin! And lastly, I added some cinnamon to the flour mixture. The recipe doesn’t call of any spices and well…what’s pumpkin without a little spice?? In just over an hour this morning (yes before work), I had these Yumkins mixed, baked, cooled, and frosted…and such little effort certainly made today’s birthday girl a very happy one. Be sure to check out what’s happenin’ over at Project Pastry Queen…I suppose it’s not a surprise that we have another pumpkin recipe ready to go for next week! To make the Yumkins: Preheat oven to 350 degrees F. Line a 12 cup muffin tin with muffin liners. Using a mixer fitted with a paddle attachment, cream the butter and sugar in a large bowl on medium speed about 1 minute. Add the egg and beat on medium speed for 1 minute. Add the pumpkin, vanilla, and maple flavor (if using) and beat until combined. Stir in the flour, baking soda, baking powder, salt, and cinnamon. Stir in the white chocolate chips and raisins. The batter will be thick. Spoon the batter into muffin cups just to the top. Bake for 16 to 20 minutes until the muffins are firm to the touch or a toothpick inserted into the middle comes out clean. Cool the muffins in the pan for 5 minutes, then invert them onto racks to cool for 30 minutes before frosting. To make the frosting: Using a mixer fitted with the paddle attachment, beat the cream cheese and milk on medium speed about 20 seconds. Add the powdered sugar 1/2 cup at a time, beating until incorporated after each addition. Coat the tops of the cooled Yumkins with frosting. Well-wrapped Yumkins will keep about 3 days in the fridge but do no wrap until the frosting has set, about 45 minutes. Yumkins just about describes this! I could stuff myself silly with this. Love the name for these, and those are two of my favorite mix ins as well, I will definitely have to give these a try! Total Yumkins! Just wouldn’t get excited about pummufcakes. Delicious! I love the name, Yumkins! Between the white chocolate, pumpkin, maple, and vanilla, I don’t think you can go wrong. And I love the name! 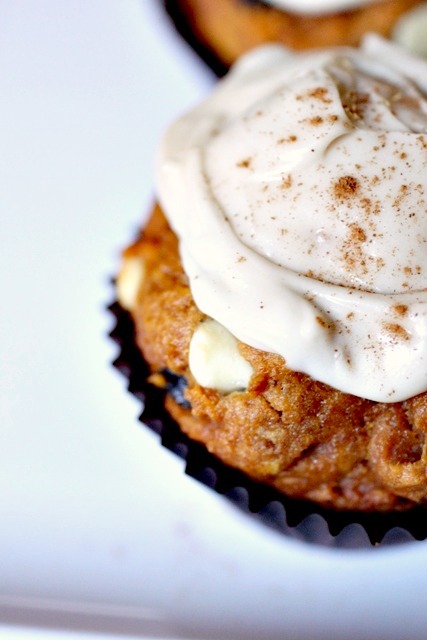 What a lovely name for this cuppies…pumpkin yumkins sounds delish. Great combo ! Yumkins, I love it! I have been baking pumpkin into everything and this shall go on the list of must bake. Thanks for his mouthwatering recipes. Love the name so fitting. These look amazing. Your pictures are incredible–I almost want to bite my screen. I’ve started a new food blog group that celebrates the printed cookbook. I’d love it if you joined us. http://www.cookbookloversunite.blogspot.com. It should be fun. I love the Yumkin idea, and the fun new term for it is delightful and fun… These look delicious!